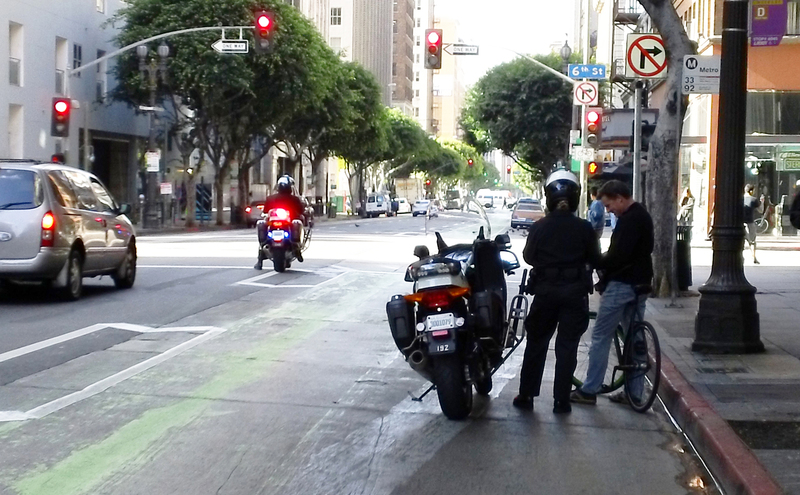 On Thursday, March 1, 2012, the LAPD Central Traffic Division deployed eight motorcycle officers to Downtown Los Angeles (DTLA) in what was called a “Bike Lane Sting.” The LAPD’s mission was to educate and issue traffic citations to motorist, cyclist and pedestrians whose actions infringed on the rules of the road. The focus was on bike lanes violations. The task force deployed along both the green striped bike lane on Spring Street and soon to be striped Main Street. I road my bike to DTLA to report on the bike sting. Within minutes of my arrival, I come across the sting in action. This post will report on four incidents that I thought were worth noting. Really, she didn't know what the big green lanes with the bike painted in it was for? Different place, different laws...but you can't go the wrong way on a one way street anywhere. The second incident involved a cyclist traveling eastbound on 6th Street. He made a left on to Spring Street heading northbound (Spring Street is a One Way traveling southbound.) As the cyclist weaved his way thru traffic and made the left turn he came right to the front wheel of another traffic officer. The officer issued the citation and I witnessed the officer explain why he was receiving a citation. I spoke with the cyclist after the officer finished issuing the traffic ticket. The cyclist in his early 50’s did not want to be interviewed, until I explained to him that perhaps he could prevent a fellow cyclist from receiving a citation who may read this post. The title of this picture was "nut in traffic." The third incident: A cyclist caught my attention by his acrobatic antics on wheels, it was funny to see his dog and pony show but in a blink of an eye he became a very dangerous bike rider with disregard for public safety. I followed him from a safe distance and noticed him swerving across all traffic lanes from curbside to curbside. All of a sudden, at Spring and First Street0s, he went into a craze and stopped all traffic traveling in all directions with very dangerous maneuvers, at times challenging motorist head to head as they tried to drive around him causing complete chaos. Unfortunately there were no traffic officers around to write him up. The sign mentions the area is monitored by the Department of Public Safety. 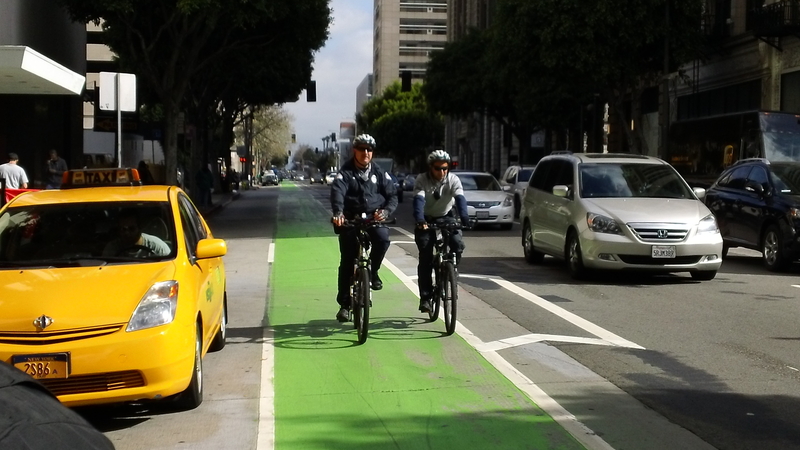 Even though LAPD officers were specifically looking bike lane related violations, we noticed a several violations that were not being enforced and completely ignored. Oversize delivery truck blocking a portion of the lane, this one was parked here for an hour and several motor officers and bike patrol officers road by without citing this vehicle. In the picture there is a sign that reads; “NOTICE, FOR YOUR SAFETY THIS AREA IS MONITORED BY THE L.A.P.D. VIDEO CAMERAS.” Are these the video cameras that were reported in the Los Angeles Times last month that they are not operating OR is someone not doing their job of Public Safety? The fourth and most notable incident: A film production company for the TV series “Ringer” was shooting a scene at 626 Spring Street. When I rode by the first time there was lighting and grip equipment in the parking lane between the curb and bike lane. 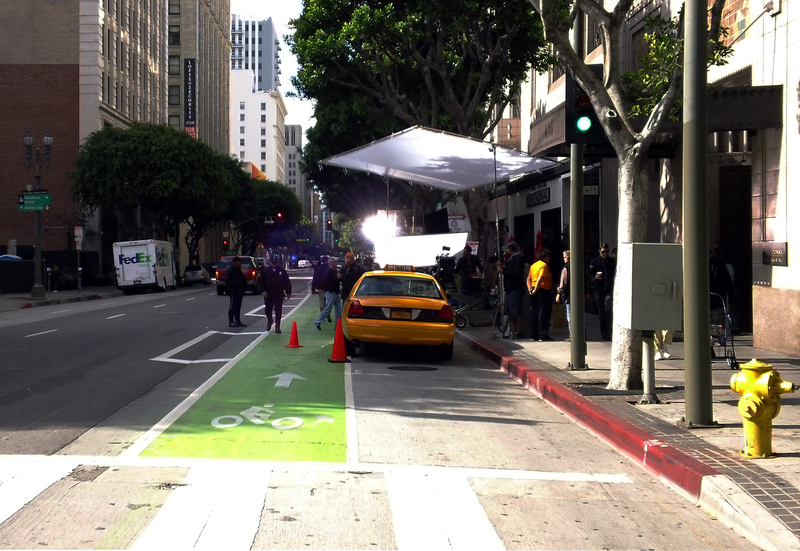 On my second pass of the 18-block tour, the lighting, grip equipment and crew began to move and setup in the middle of the bike lane. I witnessed a passing cyclist which had to swerve out of the bike lane and onto traffic lanes at times, as crew members were carrying equipment onto the street. I began to take pictures to document several violations taking place IN THE BIKE LANE. First of all, there were no traffic officers / police officers / LADOT / security guards upon my arrival on the street securing the cyclist safety as they rode by the obstacles and crew members concentrating on setting up the gear, there was no signage as required by CA Department of Transportation. There was no LADOT alerting or directing merging traffic, there were no safety cones setup alerting motorist and cyclist of the closure of he bike lane, no flagman posted to slow traffic down, and no lighted directional signs. Not until I requested to see a city issued film permit to block the bike lane did people start to move. All of the sudden two retired LAPD Officers who were hired for this shoot came out from a nearby parking lot and positioned themselves IN THE BIKE LANE and began to waive down the cyclist in an uncoordinated fashion, the first officer pointed cyclists right into the path of the second officer. However, the security officers made no attempt to slow automobiles as cyclists approached the danger zone. Each cyclist basically had to maneuver themselves to get past this dangerous and illegal activity. While witnessing this fiasco I contacted LAPD Sergeant David Krumer of the LAPD who amongst other duties is liason to the LAPD Bike Task Force and asked him if he had time to research what was going on. He made time to come and see for himself. During the wait several LADOT automobiles passed by the shoot. To make matters worse, A Los Angeles City Fire Marshall assigned to this film / video shoot was standing only thirty feet behind me witnessing the entire scenario unfold. He kept his hands in his pockets just looking at me take pictures and remained quiet as Krumer and I talked to Lazzaro and Storm. He did not make one attempt to ensure public safety measures were in place in the bike lane, during the entire duration (well over an hour) while I was present on scene. After our group conversation to address the concerns I had brought up, and with Sgt. Krumer’s departure back to his office, the crew began to wrap up their outdoor shoot and began to clear the bike lane. Their next shot was a scene indoors. I thought I made my point and as I saddled my bike and looked back to get ready to merge onto the bike lane, a white van pulls up in front of me, blocking the bike lane again, doors swing open while security guards waited on the sidewalk. I remained in disbelief that it was happening again, only minutes later. The crew had walkie-talkies and could have easily communicated with the driver to STAY OUT OF THE BIKE LANES. As I reached into my backpack for my camera, a couple of handlers whisked an actor into the van, doors slam close and the van speeds off. The van had plenty of room to properly park in the parking lane but again disregarded public safety and the Green Bike Lane. I looked back at the LA City Fire Marshal, he just turned and walked away. On this day I witnessed first hand a tremendous disconnect for Cyclist Safety by LAPD Central Bureau Motor Officers, LADOT, FILM LA, the CBS production company and LAFD. A meeting must take place between all these agencies and include the LAPD BIKE TASK FORCE in order to keep LA moving forward. 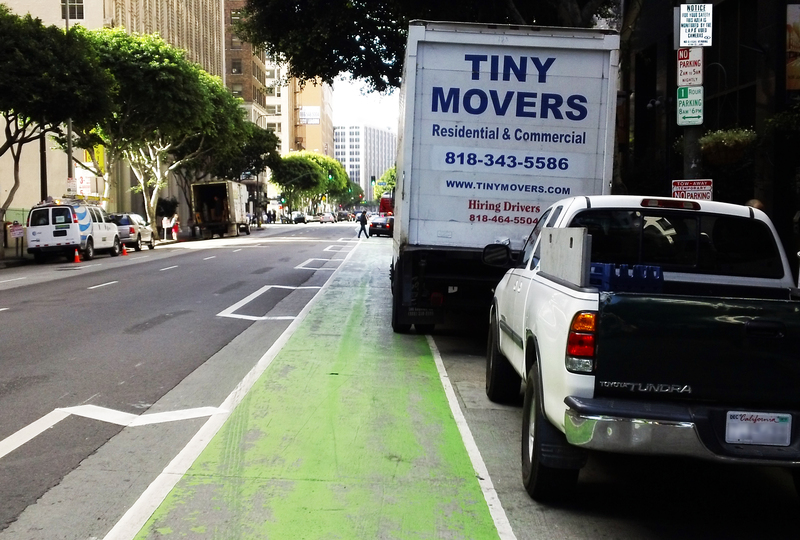 Its one thing to say LA is becoming bike friendly on paper, or at a press conference, or website post, its another thing is MAKING IT HAPPEN. 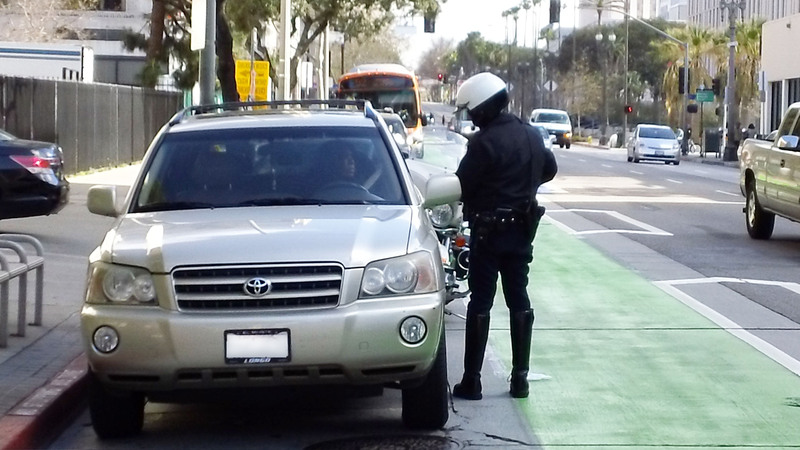 In the future when the LAPD Bike Sting Task Force is deployed, looking for violators – open your eyes! Here are the results of the LAPD Bike Sting presented to the LAPD Bike Task Force the following day. Carlos Morales’ weekly column is sponsored by the law firm of Gordon, Edelstein, Krepack, Grant, Felton & Goldstein, LLP. The ‘nut in traffic’ is a mainstay in DTLA. I appreciate him – he’s been around for a while. Clearly there are some mental health issues at play, although I find him to be very calming. He’s the traffic calmer! Sounds about right. When I’ve used this lane (which is awesome, by the way) my biggest issue was with people on their phones, texting or talking, driving in the bike lane. The Hollywood stuff and other things blocking the road I sort of overlook because these folks always seem to do stuff like that, permits or not, and there is too much money changing hands on too short a timescale to have any meaningful affect on the way they operate. Maybe that is just me being cynical. I feel like blind/ignorant car drivers are where the gains are to be made. I still couldn’t see my kid riding in this lane next to me. I am a pretty die hard bike rider at this point – imagine how a parent in DTLA would feel with their 7 year old. The green buffered lane is a massive improvement over what we’ve had in LA for generations, but there is more that can be done to make LA’s streets safer. We need physically separated bike lanes. Duh!!! He’s the bike dancer from East LA. I have seen him several times doing his bicycle ballet routine over the years. I think the kids on LA Eastside blog captured a video of him a few years ago going his thing. To me, he is like Harry Perry (turban playing guitar in Venice) of the Eastside. What is the breakdown of the Cyclist violations? Were they all for No Brakes? I actually sort of understand the first one, if the driver was from Long Beach where green is used as a sharrow lane. The thing about this to me is that it’s obvious the LAPD will now go “okay, that’s done” and ignore these issues for (years) until they have another special thing. Cars will block the bike lane every day, all the time, and the authorities won’t do anything because they’re not on a “sting.” So in a sense this is worse because it gives them the option of saying they’re doing something for cyclists when in fact they are not. I’d say that’s a pretty generous interpretation. The bike lane has solid white lines indicating that a driver should not be merging into the area. I don’t know if she was acting with malicious intent, or just general ignorance of the meaning of lane symbols. Even if it was the latter, that’s no excuse. One year on the Parking Day ride Damien made us take a left in DTLA when left turn restrictions were in place. Luckily we got away with a warning. Or Maybe I led the ride on the left. I’m curious to learn more about the citations for no brakes for the cyclists. Did the LAPD ask them to do the “skid test” on dry, level pavement? “The Crazy Bike Guy” loves the Spring Street Buffered Bike Lane! Here he is, up close and personal, in this pre-bike-lane-on-Spring video. I took a photo of General Services Police parked side-by-side across the entire Spring St lane across from City Hall for more than 30 minutes. Forget ticketing others, stop doing it yourself! That would be in 2009…less than a week later Sammy was born. It was me in the lead. I missed the sign at the light I was so busy focusing on the oncoming traffic. That was my bad and the officer was forgiving, but if I had gotten ticketed that day I would have deserved it. Yes, this guy makes his commute from Boyle Heights / East LA to DTLA. He is often funny and does a great Michael Jackson routine grabbing himself between his legs. However, this guy goes went into a crazed moment and held traffic in all directions, everyone honking at him, motorist, taxis and busses. Pedestrians were shocked and stood in the middle of all the street as they caught by surprise in the crosswalk, trying to find out which way was it safe to walk as cars began to move away from him. 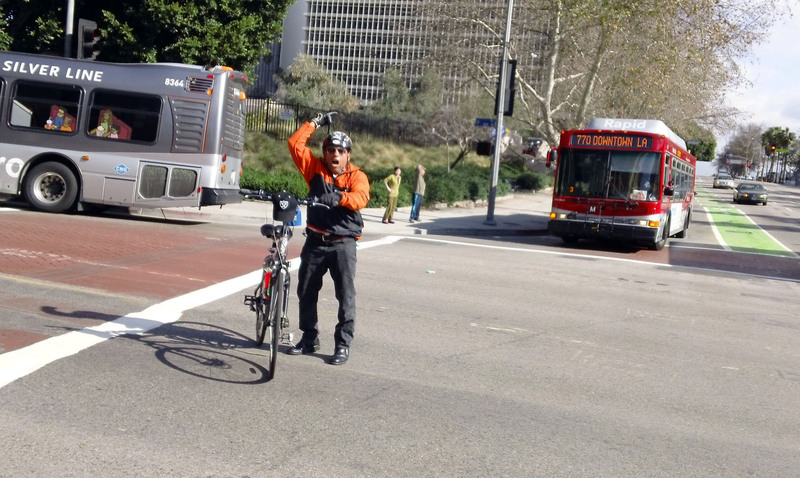 In this photo he is clearly going in the wrong direction in the number one lane, right in front of LAPD HQ. I bike and drive down this section of Spring St. daily and at least once a week I see motorists driving in the bike line, often for an entire block. A common mistake is when cars turn right onto Spring and don’t make a wide enough turn, winding up smack in the green lane. Also, motorists will almost always merge into the bike lane before turning right into a parking lot instead of waiting in the right-most car traffic lane for an opportunity to safely turn into the intended driveway. Don’t let the doors hit ya where the good lord split ya. More city for the rest of us! This happened before the lanes, it is happening after the lanes, it will continue to happen until General Services is no longer in existence. Law enforcement, movie crews, government vehicles, clueless motorists – anyone in a car with the state or commerce behind them does whatever the hell they want on our roadways when it comes to parking, etc. This is why cars destroy so much when we run them through the core of town at 30+ miles per hour, and give them the largest share of the right of way. Actually, in California motorists are required to merge into the rightmost lane (even if it’s a bike lane) before turning. It’s different in some other states; I think that the way we do it is better because it avoids having cars turn across a travel lane. Carlos, thanks for keeping us informed. I applaud you for the respectful but firm way you represent the interests of cyclists. Keep it up. Admittedly, this is counter-intuitive for most drivers, so I can see why so many people make this mistake. Perhaps the city needs to put up some better signage to make this rule clear. What’s going on with the “no brakes” citations? The CVC doesn’t require brake equipment per se, only that the rider have the ability to “make one braked wheel skid on dry, level pavement.” The distinction is important in today’s age of so many fixed-gear, brakeless bikes. I don’t want to see a ton of kids getting tickets for something that first of all, is legal, and second of all, isn’t (in and of itself) hurting anyone. Riding recklessly, with or without hand brake equipment, is the issue, not the equipment itself. Seems like the LAPD might need to be educated on what the law says, if they were ticketing people for not having brakes. Or were these actually “failure to stop” citations? One hopes so, because that would actually be enforcement of a real law. The dancing bicycle rider of East LA !! He’s everywhere, and as Carlos pointed out, never gets caught in the act by LAPD. He may look like he’s off his rocker, but he knows what he’s doing. AS ‘crazy’ as he seems, he always puts on a good show. Equipment (CVC 21202 and 21204) Bicycles must be equipped with at least a brake which allows operators to execute to a wheelskid on dry, level, clean pavement. I interprete that to mean one front brake, no?? Perhaps it’s been stated before, but the worst (yet avoidable) offenders appear to be Metro and Dash buses. Some of these drivers are fine, but plenty clearly need to be (re)trained on the new Spring Street and preferable modes of crossing the bike lane and buffers. It’s not uncommon on my daily commute on Spring Street to see a bus driving an entire block’s distance either wholly in the bike lane or straddling the bike lane/buffer zone. I’m very curious as to Metro’s training (assuming there is training), and how Metro is following up to make sure things are put into practice. Glad to see the LAPD are enforcing Biker laws under Chief Beck, but will allow Illegal Drivers without licenses to not have their cars impounded for 30 days if/when stopped. Last I knew, California does not require a license for bike riding as it does for driving a car and with insurance too, but bikes w/o brakes is a fineable offense. LA is a screwed up place. CVC21217 requires those who wish to cross a bike lane to make a turn to enter the bike lane before starting their turn. Tim Fremaux, as far as I can tell, is wrong. I’m open to different interpretations from lawyers offering legal advice. No. The law doesn’t say “one front brake” or “a brake not operated by the foot” or “a brake independent of the drivetrain”. It says that the brake must enable the operator to make one wheel skid. A fixed gear generally satisfies that requirement. The Sacramento Bee picked up on the article and took notice what is happening here in Los Angeles. Behold the 1st Street Bike Lanes! Now Where Was the Outreach?